Methylenetetrahydrofolate reductase (MTHFR) is a gene mutation that affects how your body handles folate. Nearly half of all people have a mutation in the MTHFR gene. Using the activated form of folate, such as MethylPro®, can override the MTHFR genetic mutation and help you get the folate you need for brain and cardiovascular health. Folic acid and folate have to be prepared by the body before they are ready to use. Folic acid (red) is synthetic (man-made) and enters the body in the form of over-the-counter vitamins and fortified foods. Dietary folates (red) occur naturally and come from fruits, vegetables, and whole grain products. Enzymes (blue) needed to activate folate are dihydrofolate reductase (DHFR) and methylenetetrahydrofolate reductase (MTHFR). Once L-methylfolate (otherwise known as 5-methyltetrahydrofolate or 5-L-MTHF) is produced, it can be transported into cells, tissues and even across the blood-brain barrier. Folate deficiency arises when people have poorly functioning enzymes in the pathway, such as an MTHFR mutation. What is Your MTHFR Status? If you have an MTHFR gene mutation, your MTHFR enzyme is not optimal. This prevents folate from doing its job to keep your brain, cardiovascular, and reproductive systems healthy. Because of this mutation, you may not be getting enough folate, even with a healthy diet and a multivitamin. 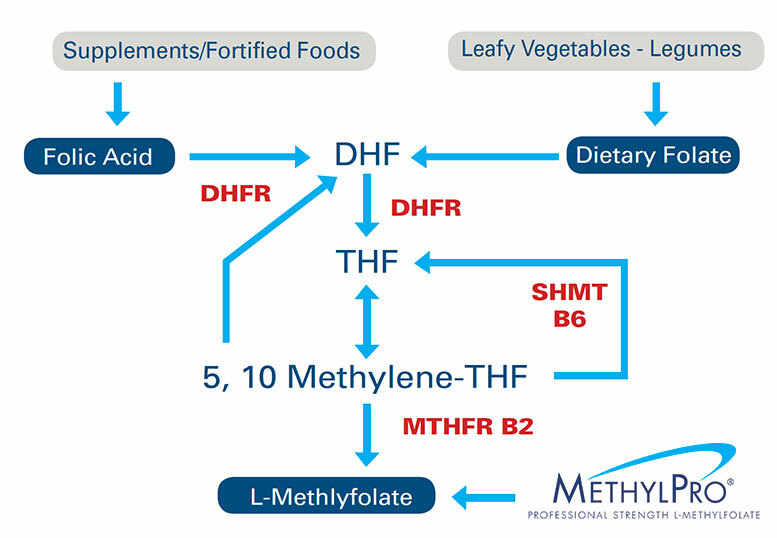 Taking L-methylfolate can supplement your nutrition and help support the MTHFR mutation, giving you the folate you need. As with all genes, you get one copy from your mother and one copy from your father. Some people have a mutation in one or both copies of the MTHFR gene. There are two common MTHFR gene mutations: C677T and A1298C. You can have either one, or both. Don’t get confused by the names. They are just number and letter codes that tell scientists exactly how the DNA is switched up for these mutations. You have two mutated copies of the MTHFR gene and your MTHFR enzyme is probably working poorly. You have one functioning copy of the gene and one mutated copy of the gene. The MTHFR enzyme may be working slowly or inefficiently. You do not have any mutations in either copy of your MTHFR gene. This is the optimal result. You or your doctor can order a test to find out if you have the MTHFR gene mutation. Your physician can order the test from laboratories such as: Kashi, Genova Diagnostics, LabCorp, Quest Diagnostics, and SpectraCell Laboratories. 23&Me is a lab test that you can order without a doctor’s prescription. MTHFR is a common gene mutation that can affect how your body handles folate. If your MTHFR enzymes are working slowly, then you cannot get the benefits of folic acid found in food and dietary supplements. 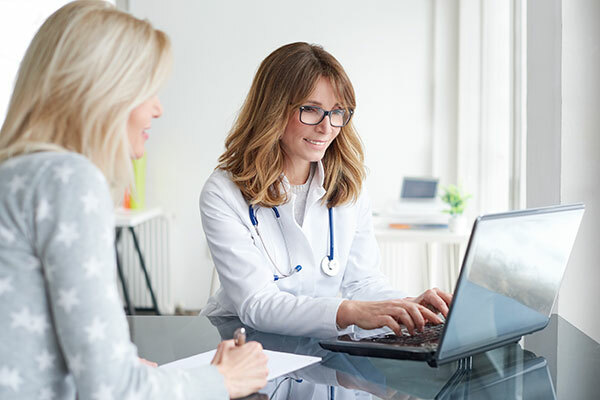 Your doctor might recommend MethylPro® to bypass your MTHFR gene mutation and boost your folate levels for brain, cardiovascular, and reproductive health. 1. Moll S, Varga EA. Homocysteine and MTHFR Mutations. Circulation. 2015;132(1):e6-9.